1. “Low Fat” or “Fat Free” foods are probably not good for you. There are a ton of products on the market that advertise as being “low fat” or “fat free”. There are some products out there that naturally fall into these categories, such as rice cakes or fruit. Those foods are fine, what you want to look out for are things that would normally have fat, but have been engineered to have reduced fat or no fat. Things like cookies, breakfast bars, brownies, etc. These items have probably had a ton of processed & artificial ingredients added to them so as to replace the texture of the missing fat. I recently received a comment on my blog that at first seemed legit but later revealed itself as nothing more than scammy spam. The poster was explaining their life with Crohn’s Disease & how debilitating it was. There was actually a great deal of content to this comment & what the person talked about sounded rather convincing. The only problem was that near the end of the comment they started talking about how while nothing else worked, they found someone who would cast a spell for them & miraculously they started to heal from their Crohn’s Disease. What modern medicine & alternative therapies couldn’t treat, wiring a random stranger money so they could write a spell for you did. There seems to be some continual confusion about the differences between Irritable Bowel Syndrome & Inflammatory Bowel Diseases. The main difference between the two is that Irritable Bowels Syndrome is a functional disorder, meaning there is little to no physical evidence of the disorder besides it’s symptoms. 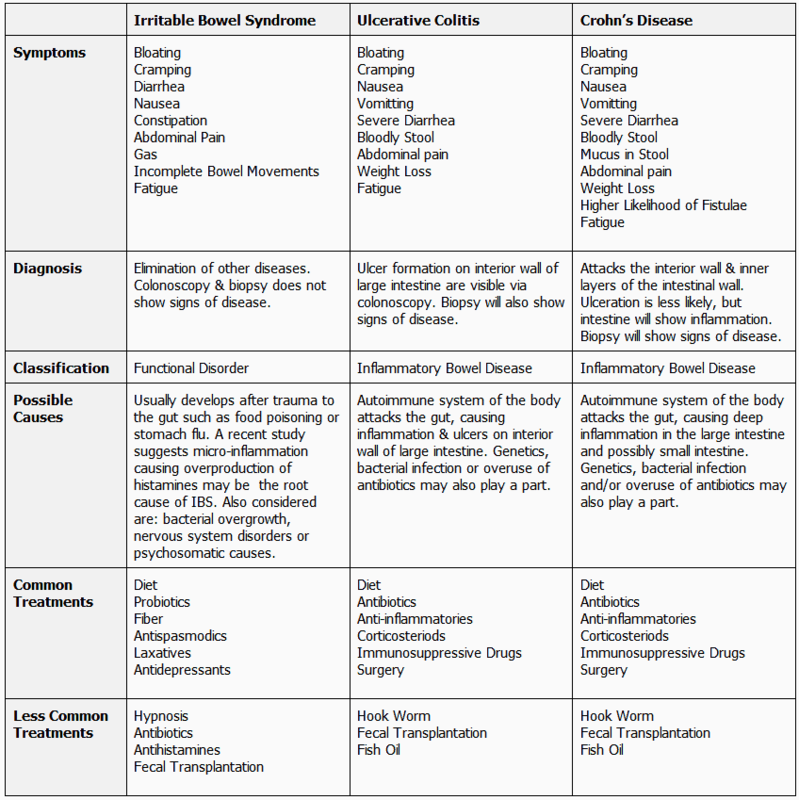 Inflammatory Bowel Diseases are not functional disorders and are diagnosable based off of physical evidence. Irritable Bowel Syndrome is usually much less severe than Inflammatory Bowel Diseases. 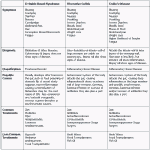 Additionally “Inflammatory Bowel Disease” is not the actual name of a disease, but a classification for bowel diseases of an inflammatory nature. The two main Inflammatory Bowel Diseases are Ulcerative Colitis & Crohn’s Disease. They are not the same thing, though they have similar symptoms & treatments. I made this handy chart below so people can get a better idea of the differences. Special thanks to Hypnotherapy Directory (UK) for writing this detailed post on Hypnotherapy. Many suffers of Irritable Bowel Syndrome only get occasional pain and discomfort, but for some the condition can effect their lives on a daily basis. You may suffer from constipation, or diarrhea, some may even have both. Pain can vary from mild to severe and can occur at any time of the day. You may also be suffering from indigestion, nausea, cramping, heart burn and muscle pain. Most people will find themselves dealing with constipation one point or another in their lives. Sometimes synthetic laxatives can be harsh and uncomfortable to use. Before reaching for a laxative drug, perhaps you can give these natural remedies a try. Even if you feel sluggish from constipation, it’s still a good idea to try to get some movement going. Try to focus on the abdominal area. Getting blood flowing through your system may help wake-up your gut to start moving things again. Magnesium is an element that attracts water, this can help soften stool that may be to stiff to allow easy passage. You should look for a magnesium supplement that does NOT have calcium, as calcium will only worsen constipation. Look for a magnesium supplement that has about 250 – 500mg. Ginger is great for your digestive tract all around. In some cases it can also help with constipation. I’d try a ginger tea or Ginger Chew candies. Iberogast(STW-5) is an herbal mixture that helps with digestive movement. I would try taking it on an empty stomach instead of with a meal and see if that will get your lower bowels moving again. Many juices can have a laxative effect & are usually pretty gentle. The most well known is prune juice, but other juices such as grape or orange juice might work for you as well. I myself do not like the taste of prune juice, but will happily drink grape or orange juice. For me these seem to only cause a bowel movement if I am dealing with constipation, otherwise I don’t get the laxative effect(which is a good thing!). This seems to always work for me, but it is the last on my list as usually it causes quite a bit of gas as well. Raisin Bran cereals taste pretty good & can definitely get your digestive motor going. It’s probably a bit harsher than the other items listed here, but if nothing else has worked, raisin bran probably will. You could also try other things like a bran muffin or an over the counter fiber product. Do you have a favorite natural constipation remedy? Please post it below.